A limited edition run from Five Pawns. Described as "Intense complexity of Irish cream, cinnamon spice, and caramel with subtle absinthe undertones. Lively and with a medium to full bodied throat hit. "This juice is no longer produced, and it's unlikely it will return to production. 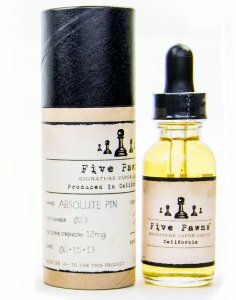 Five Pawns were one of the first to introduce a "premium" line of e-juices, and one of the first to hit the market was Absolute Pin. It has a very unique blend to it, where it doesn't get too sweet or too spicy - Balancing the Irish cream with the cinnamon. And it's really the cinnamon flavor and smell which makes this a unique and excellent e-juice. While some of the Five Pawns premium series were a bit of hit and miss, this was instantly miles away from many of the competing producers at the time. It does have a very special flavor, and not to everyone's liking. But few have managed to emulate the kind of cinnamon flavor which the California based company did with this classic.